Our second instalment of the Fascinating Expedition and Adventure Talks (FEAT) involves a blast from the past, two friends greater than most, and a man that won’t let illness stop him. Heavy hitters this week! Frank: All the World’s a Stage: a quick, humorous rundown of the various subliminal ‘characters’ that have emerged during my expeditions over the years. ML: One of the rowers, Denis Barnett, spoke at FEAT last year. Did the team come to you to document their story or did you hear about them and decide that was your next project? I’ve been great friends with Kevin Vallely (this year’s MC at FEAT – ed) over the years through various expeditions we’ve done together. I was asked by him to be an equal expedition partner for the attempt at the NWP. Kevin and I took our shifts at the oars together, and I did the navigating. The camera just comes along as part of the package. ML: As a filmmaker, one is supposed to remain neutral and out of the story as much as possible. Was this even an option in an area as inhospitable as the Northwest Passage? I don’t think there are rules in filmmaking- so there is no ‘supposed to’ when it comes to any film. Like expeditions, films should push the boundaries of existing notions of possibility. Being out there reactively filming as situations arise requires you to be flexible in your approach. I fluidly poke in and out of my films, putting myself in the narrative when it’s necessary, removing myself when I don’t need to be there. My goal with any film is to bring the audience intimately into the expedition experience and will do whatever it takes to achieve that end. The Northwest Passage trip actually had more downtime than I’m used to on an expedition as the wind and weather kept us from moving anywhere a lot of the time- so the the other three members of the trip have most of the facetime. I’m mostly just in there during scenes where I’m interviewing the the local Inuit and Inuvialuit people about their perspectives on climate change in the Arctic. ML: Was there anything in particular that really hit home for you on the voyage in regards to environmental change? I think the species migration that was pointed out to me by the Inuvialuit and Inuit shows how rapidly climate change is happening there. In just the past few years, grizzly bears have moved up to the Arctic islands (we saw two of them) along with Ravens, Orca, Beavers etc. These southern species never used to be in the Northwest Passage- and their presence there now shows how quickly the arctic is warming up as the climate becomes more palatable to them. Of all the speakers this year, these two might be the most interesting. The dynamic team of Jason Cole and Rand Surbey have set the bar high in terms of athletic achievement and pushing the limit! As proud founding members of SymbiAthletic, an organization devoted to introducing people with disabilities to competitive racing and other adventures, Jason and Rand have created opportunities for many to explore and to believe that anything is possible. 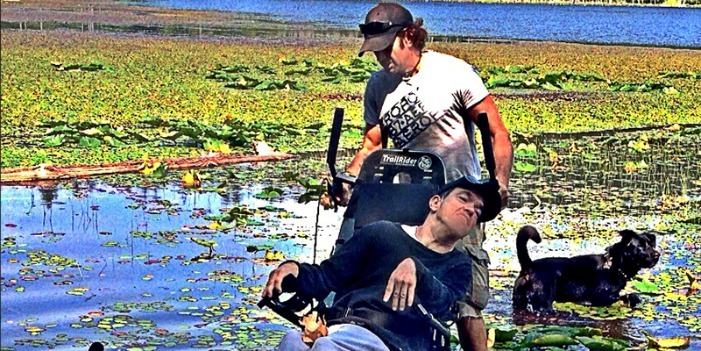 Always looking for the next great adventure, Rand Surbey doesn’t let anything stand in his way despite having to contend with cerebral palsy. His difficulties with motor control and requiring a computer board to aid communication. He faces challenges every day that most others take for granted. Jason: Our presentation will focus on the daily challenges someone with Rand’s ‘obstacles’ has to face and coordinate them with what we do in our adventures. Specifically in this case we will talk about our tackling the Tough Mudder in our custom homemade mud chair. ML: Although every speaker is inspirational in some way, you two are perhaps the most so. How much work (man hours, effort, etc) goes into designing and building a bike setup? Thanks for the kind words :). We have run a number of half marathons on chairs I’ve built specifically for running. These usually take me on average between 50-100 hours of designing and constructing, not including the lead up training on each new racer. The chair for the Tough Mudder took double that. Rand has very severe issues with his Cerebral Palsy. This means he is without muscle control of most of his body including no voice. Keeping him safe yet still able to ‘feel’ the mud under his feet was the foundation of this design. There have been many other wheelchairs that we have seen in our years doing the Tough Mudder out there. But absolutely none that we have witnessed that allowed somebody with Rand’s level of disability to not only come along for the trail parts but actually do some of the events himself! ML: Tough Mudder couldn’t have been an easy task. What was the main challenge in that race? The toughest part of the event was getting people to take us serious in the first place. It was difficult to get people to fully comprehend what we were trying to do before the event and if you have never done the Mudder it’s even more difficult to fully explain. But what is tough for some people is a near impossibility for others. For someone like Rand where brushing his teeth or even something as simple as a handshake can take tremendous amounts of concentration and effort- the event itself was easy. Getting to the point of entering it was the challenge. ML: Is there an Ultimate Challenge you two would like to complete (for example, an Ultra Marathon, Ironman, or an ascent)? Our current challenge, and therefore most difficult one at this time, is our desire to partake in the Gran Fondo. Neither Rand nor I are cyclists. In fact I cannot remember the last time I dusted off my bike at all. But right now we have partially designed and partially constructed a tandem bike that we hope will get us the entire distance from Vancouver to Whistler. Born and raised in North Vancouver, Peter Marshall has always been an athletic person. From competing internationally in swimming to enjoying outdoor pursuits like hiking, skiing, and surfing, Peter has continually pushed his skills to the next level. In his 20’s he completed several big adventures, some of which included cycling across Canada and Western Europe, and finishing Ironman Canada in 2008. After a couple years of intense medical treatment, Peter made it to a state of remission, allowing him to plan an adventure to raise awareness of this rare condition. 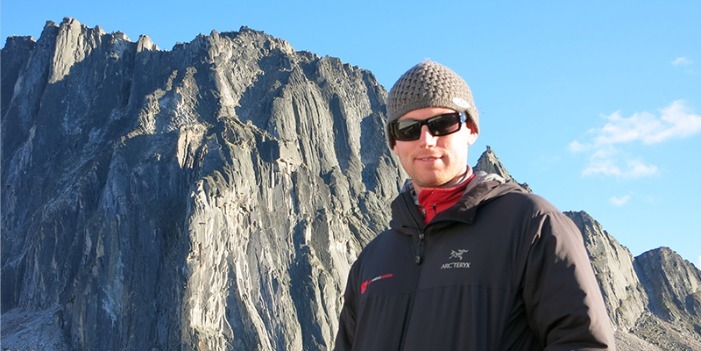 In July 2013, Peter completed a self-supported cycling, skiing, and climbing trip from Vancouver to the summit of Mount Rainier and back (his full blog chronicling the expedition is online). Despite the illness, Peter continued to persevere and did not allow anything to take away his ambition. His determination and desire to remain active in spite of unfortunate circumstances remains his greatest achievement to date! 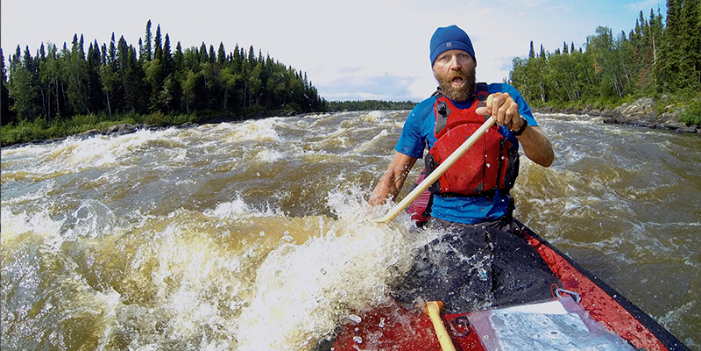 Peter: Bouncing back from a deadly diagnosis to push my limits and reach new heights – completing an expedition that would have challenged the healthy me. ML: Astounding work, Peter – surely this was a mental battle as much as a physical one? Yes. The physical aspect was tough. I just didn’t know what I was still physically capable of given my lung damage and other medical challenges. What would 14,000 feet feel like with 60% lung function? But the mental side of it may have been a greater battle. I had to learn to adjust my pace and learn what my body could do now, and then listen to my body instead of fighting to keep up with my trip partners. It was also a constant battle feeling exhausted and slow much of the time but knowing that I could still push on. ML: Was there a point throughout the journey that put a little more gas in your reserves to help you persevere? I think the boost for me came on the first day of climbing. It was a tough 4 day ride getting to the mountain and I was generally slow and felt tired. As we geared up (6 of us) and started to climb from Paradise to Camp Muir I felt cautiously optimistic but very reserved. I wanted to move slowly and efficiently and save my energy for higher on the mountain. Throughout the day I started to move ahead of all my climbing partners and reached the camp well before them. At this point some of them were dropping out from fatigue but I finally felt like I could complete this goal and reach the summit. I realized that I could pace myself very well and I could recover after several days of hard work. ML: What was the final amount raised? Do you have any future plans for fundraising? Tickets for the show are still available right here.